You know what they say about the most important aspect of a home: Location, location, location! Well, I’ve got a pretty prime one, situated on over 11 acres of wooded paradise at the top of Piney Mountain, part of the scenic Blue Ridge Mountains, in southern North Carolina. It doesn’t hurt a house to have a good name either … did I mention I have the whimsical moniker “Top O’ Piney”? 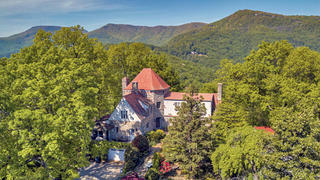 I was built in 1928 as a grand home for Prentice and Nora Luckey. Prentice Luckey was an importer/exporter of fine jewelry in New York City, who eventually worked for Cartier Jewelers. I’m just a short way from the village of Tryon, a quaint place with strong equestrian and artistic traditions and plenty of beloved local shops and restaurants. Located an hour’s drive from Asheville, North Carolina, and Greenville, South Carolina, I am lucky enough to be located in an isothermal belt, meaning I experience warmer winters and typically cooler summers than the rest of the sunny South … not a bad deal! My stone walls house over 3,000 square feet of space, marked by ample-sized rooms like my lofty Great Room, capped by beams featuring carvings of grapevines, inspired by the once-world-famous grapes that used to cover the mountain. Throughout, you can find the sorts of delightful details that make historic houses so fun: a spiral staircase, retro wood paneling, exposed stone walls, arched doorways. Two covered porches, a master suite with two full ensuite baths, and a dining room with a wet bar are some of my other notable spaces. Bedrooms and sitting rooms feature built-in shelves, and one even has a huge window seat in front of a bay window, perfect for bookworms. A guest house with a kitchenette and apartment over a four-car garage is a short walk away. My beautiful location is enhanced by impeccable landscaping featuring stone paths, seating areas, and fruit trees, roses, azaleas, and an abundance of other visual delights. Probably my crowning feature though is the extensive stone terrace, from which you can view sunsets over the surrounding mountains—an unparalleled view right outside your screen door. Ready for a room with a view? Check out my full listing. 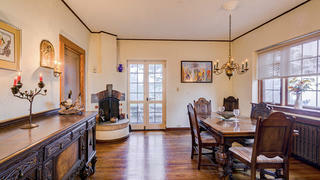 My delightful dining room has wood trim, a rustic fireplace, and a wet bar. 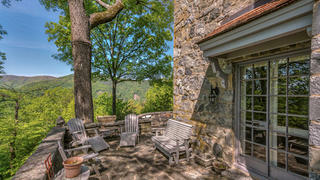 A stone terrace hugs two sides of the house, looking over the incredible surrounding landscape. Rebecca Gale is an Editorial Intern at the National Trust. In her spare time, you can find her visiting local museums, photographing historic buildings, or playing guitar.